In the faraway dusty North-Western desert of Jaisalmer in India thrive the Merasis, a community that seems to be on the brink of being forgotten in the era of modernization. Merasi is a folk community descending from Rajasthan which is striving to compose, perform and sustain their vibrant musical legacy till date. The community has carried their unique musical legacy for over 800 years. Even after being deemed as an intangible cultural heritage by UNESCO, the Merasi community continues to yearn for earnest appreciation and a heart-warming applause. A community of about 40,000 people in and around Jaisalmer, the Merasi community had been scorned as Manganiyars (beggars). They were treated as untouchables and did not attain basic rights such as education, political rights and healthcare. Even today, they struggle to be regarded as more than just Manganiyars. For about 40 generations, the Merasi have made a living by singing paeans at the temple of a local Hindu goddess named Bhatiyani, by performing at weddings, child-naming ceremonies and other events. 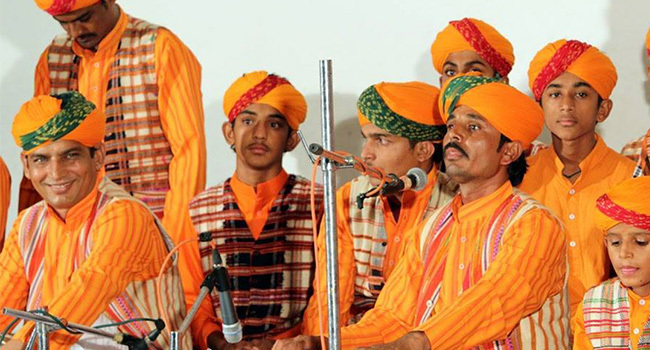 Their music is a particular kind of Rajasthani folk sound that is lyrical and melodic yet full-bodied and vigorous. Originally Hindu, they were converted to Islam in the 17th century by the Mughal emperor Aurangzeb. But the Merasis’ loyalty to the goddess kept them anchored to their Hindu roots, making them one of India’s many contradictions – Muslim by name, and Hindu by custom and occupation, adding to their identity woes. What makes the Merasi community’s music so appealing to their audience? Their tunes are not just musical notes played together, they have a soul of their own. They reflect their heritage by depicting stories of the community from birth to death and their array of songs are sung on different occasions, from Dussehra to Deepavali and even Holi. This talent and passion for folk music has fortunately found an anchor in Sarwar Khan, a local from Rajasthan who registered the Lok Kala Sagar Sansthan (LKSS) in Jaisalmer (India) to serve as the community centre for the Merasis. He was later joined by the New-York based non-profit, Fold Arts Rasjasthan (FAR), established in 2004 by Karen Lucas. Khan and Lucas work together to provide a thriving and unprejudiced future for the talented yet unrecognized community. How are they helping the Merasis to keep their dream alive? The Lok Kala Sagar Sansthan (LKSS) and Folk Arts Rajasthan (FAR) have created a special course which caters to both the academic and musical needs of the Merasis. Children who are academically inclined and are exceptional students get chosen to become mentors for other children. Folk Arts Rajasthan (FAR) hosts several gatherings at Lok Kala Sagar Sansthan (LKSS) where they invite children from Jaisalmer and other rural villages to share knowledge, play music together, and work towards empowering the community and increasing their self-worth. They have formulated a series of activities to preserve the Merasi sound. Volunteers and students come together and regularly add recordings to the growing archives housed in New York. FAR accompanies Merasi to Mumbai for an annual trip where they perform and get to explore the city. This helps them showcase their talent to other people and is instrumental in preserving their legacy. Merasi themselves have created the ‘Merasi Legacy Project.’ Students gain access to stories of their community and record them to compile it into a collection, which is used by them as a source of inspiration for their music. On the 26th of June, Palava got an opportunity to host these legendary Merasis! The citizens of Palava watched in awe as the musicians showcased their legacy while rendering soulful tunes at the Lodha World School. The love and passion for their music was evident on the faces of the Merasi musicians whose devotion and enchanting renditions mesmerised the audience. There were cheers of appreciation and tears of joy! The Merasi Musical Concert was hosted by an active Palava citizen’s group called The Renaissance Group. This group aims to form a city community wherein like-minded individuals can enjoy and participate in engaging activities in and around Palava. The sheer dedication and passion of the group members resulted in Palava witnessing folk music at its best. Even as the Merasi persevere to sustain their music today, their soulful tunes have managed to captivate many across the country but their struggles for basic rights still pose a threat to their dream.